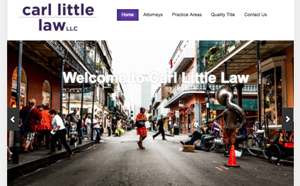 Design Burd Inc.Take a look at Carl Little Law | Design Burd Inc.
Carl Little Law is a brand new law office in the heart of New Orleans. The large image slider shows vibrant, eye-catching photos of the colorful city, creating a wholesome connection with the culture of New Orleans. Check out Carl Little Law!